This amazing collection contains well over 215 classic songs from the '60s, '70s, and '80s. From soft rock to hard rock, punk and new wave to metal. These professional-style fakebook arrangements feature all the critical riffs and patterns, melodies, lyrics and chords in simple, easy-to-use arrangements. Includes a complete discography. 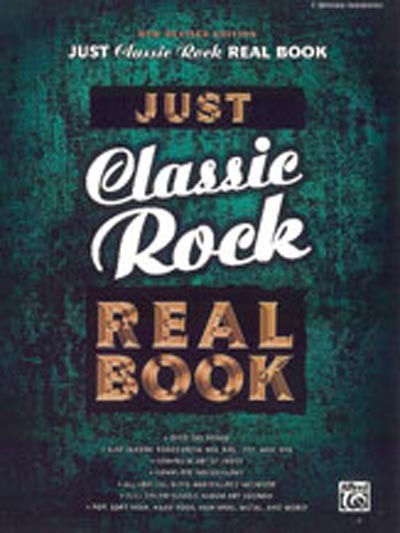 Some of the artists included in this book are: America, the Animals, the Band, the Beatles, Blondie, Boston, David Bowie, Jackson Browne, Buffalo Springfield, Jimmy Buffett, the Byrds, J.J. Cale, The Cars, Harry Chapin, Eric Clapton/Blind Faith, Eric Clapton/Cream, Creedence Clearwater Revival, Crosby, Stills, Nash and Young, Doobie Brothers, the Eagles, Fleetwood Mac, the Grateful Dead, Janis Ian, Billy Idol, Iron Butterfly, Jethro Tull, Journey, Loggins & Messina, Joni Mitchell, Van Morrison, Mott the Hoople, Pink Floyd, Procol Harum, R.E.M., the Ramones, Rod Stewart, Santana, Sonny and Cher, Spencer Davis Group, Bruce Springsteen, James Taylor, Ten Years After, George Thorogood, Tom Petty & The Heartbreakers, Traffic, Robin Trower, Van Halen, Yes, Neil Young, The Zombies, ZZ Top, and many more!!! Songs include: After Midnight • American Woman • Aqualung • Bad, Bad Leroy Brown • Bridge Over Troubled Water • Feel Like Makin' Love • Forever Young • Have You Ever Seen the Rain? • Mama Told Me Not to Come • Margaritaville • Minute by Minute • More Than a Feeling • The Night They Drove Old Dixie Down • Old Man • One • Owner of a Lonely Heart • Panama • Peaceful Easy Feeling • Pink Cadillac • Proud Mary • Stop Draggin' My Heart Around • Sunshine of Your Love • Take It to the Limit • Tenth Avenue Freeze-Out • These Eyes • Turn Turn Turn • The Waiting • Whole Lotta Love • and many more!